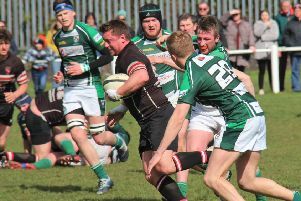 Heath look safe in Yorkshire One in spite of a 20-12 defeat at Scarborough on Saturday. Wath Upon Dearne are sure to finish in the bottom two and Pontefract, beaten 31-29 at Selby this weekend, can only draw level on points with the North Dean men if they pick up bonus-point wins in their last two matches. However, Heath will still have more wins than their West Yorkshire rivals. Heath welcomed back Jack Sheldrake in the centre and had Emlyn James, Paddy Kerr and Cam Ramsden on the bench against hosts who had missed out on a trip to Twickenham with a cup semi-final defeat against Bridgenorth seven days earlier. In very windy but sunny conditions, a great kick from Ezra Hinchliffe found touch 10 metres out and Heath bossed possession for the first seven minutes. However, Scarborough intercept on half way and the ball was moved quickly for an unconverted try in the corner. A Heath penalty was just wide and the visitors lost Eddie Cartwright injured to an off-the-ball incident. Good work from Chris Piper, Gareth Owen and Mark Puttick set up another Heath attack and after constant infringements the home No 8 was sin-binned. Heath won a succession of scrums on the home line but Scarborough held firm and cleared. Darren Neilly and Ryan Hunter were strong in defence but it needed a good clearance from Dom Walsh to get Heath out of trouble on 33 minutes. Heath turned round to play into the wind and the home side, quick on the break and very dangerous, went 10-0 up after the ball had gone loose from a scrum. This seemed to inspire Heath and after plenty of pressure a sparkling run from Sheldrake produced a brilliant solo try. Scarborough replied with a try in the corner, with the travelling supporters appealing in vain for a forward pass, and another missed conversion left the score at 15–5 on 68 minutes. Heath would not lie down and continued to control the ball, yielding a converted try from Walsh after good work from Sheldrake and Hinchliffe on 72 minutes. Heath were playing with conviction and Hunter, Johnson, Neilly and Cook were prominent. With time running out, Scarborough kept the ball alive to score in the corner and deny the visitors a losing bonus point.